While I’m not an official participant of the Coffin Hop this year, I decided to whip up a quick post to point people in the right direction. I have participated in the CH two or three years in a row, and it has always been a great time. Basically, you go from blog to blog entering contests, often horror or at least Halloween inspired. 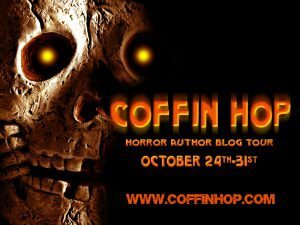 You can use this list on the official Coffin Hop page to find all participating blogs. While I have you here, I would like to mention my brand new horror audio book, REALITY ENGINEERS. If you preorder now (for an October 27th release), you will receive an exclusive preorder bonus in the mail (hit link for more details). Have you ever wanted the ability to alter the world around you? To have the very nature of existence bend to your whims? Have you ever been to Moon Hill? This great horror novella, set in the Anthony J Rapino’s Moon Hill universe is filled with strange manifestations, odd happenings and not-so-random chance encounters. It’s time for you to visit Moon Hill.